Definition at line 82 of file CQExpressionWidget.h. Definition at line 132 of file CQExpressionWidget.cpp. References CCopasiRootContainer::getDatamodelList(), mFunction, and CCopasiObject::setObjectParent(). Definition at line 181 of file CQExpressionWidget.cpp. Definition at line 146 of file CQExpressionWidget.cpp. References CQExpressionWidget::getFunction(), CMassAction::Infix, mFunction, CQValidator< QTextEdit >::mpContainer, CQValidator< QTextEdit >::mRetrieve, CQValidator< QTextEdit >::setColor(), stateChanged(), and CQValidator< Type >::validate(). Definition at line 108 of file CQExpressionWidget.h. 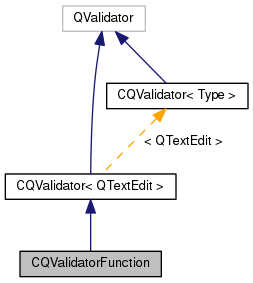 Referenced by CQValidatorFunction(), getFunction(), and validate().